This is the time of year when people are thinking about vacations, and if yours involves the great outdoors, like many camping enthusiasts, you’ll want to take your furry companion with you. Camping with your dog can be a lot of fun, but just like you, he needs the right gear to be happy and comfortable. One of the most important pieces is a camping chair. Dog camping chairs keep your dog off the cold ground and make him feel like he’s at home. Read on to learn how to choose the perfect camping chair for your dog. The disadvantages of each depend on what your camping trip will be like. If you’re planning to stay for awhile at a single campsite where having a chair stay assembled for the duration is okay, an elevated chair is a better choice. If your trip involves long hikes in the wilderness and a different campsite each night, a non-elevated one that can be easily rolled up and put in or attached to your pack is best. If you choose an elevated chair, look for one solidly built from wood or metal. Avoid plastic ones that can be iffy in quality and tend to get brittle and crack in cold temps. It’s essential that the chair be able to hold your dog’s weight and stand up to being repeatedly assembled and disassembled. Make sure the model you choose, elevated or not, is big enough for your dog to turn around on and stretch out, and that provides both comfort and ventilation. It should also be a stain resistant and easy to clean fabric because it will get dirty! Natural fabrics like cotton canvas or an ultra durable fabric like ripstop nylon are a much better choice than polyester. Medium 27" x 27" x 7.5"
This bed can be assembled and disassembled in seconds and without any tools, making it perfect to take on any camping trip. The cover is removable for easy washing, and it comes in a variety of colors. It weighs less than 5 pounds and is made of tough, rust-resistant steel. The fabric is water resistant and UV resistant. It dries quickly and cleans easily. The bed comes with its carrying bag for even more convenience. People who own it say their dogs love being off the ground and find the plush surface very comfortable and hard to shred! Depending on the weather it can keep your dog warm or cool. If you have an older dog with joint or mobility issues, this bed is ideal for them as it is easy to get in and out of, and keeps them off the ground. Sleeping on the ground can be problematic for dogs with the above issues. Using a bed like this can help your aging pooch continue to enjoy camping with you for many more years. Unfortunately, despite being available in a large size, the manufacturer claims a weight restriction of 40lbs, so bigger dogs are out of luck. That said, some owners said their 50-60lb dogs had no issues using this brand of dog camping chairs at all. This chair comes in three sizes to fit dogs up to 100lbs. Its fold and go design makes it easy to take anywhere, and its elevated design is easy on joints. It’s lightweight yet durable and cleans easily with just a damp cloth. The material stands up to digging and scratching, and it is designed to be compact when folded and fits into its own carry case, which is included. Some owners said the chair was too high for their more geriatric dogs to manage, so keep that in mind if yours has any joint issues, but most said their dogs had no trouble with it. This chair is a good choice for those whose idea of a camping trip is hiking in the wilderness due to its compact design and easy portability, with no tools required for assembly. Just unfold this, and your dog is all set. Could use a little more padding, but you can easily add your own. EASY TO CLEAN: Wipe down with cleanser or soap. GREAT FOR TRAVEL: Takes up very little space when frame is disassembled. Takes only minutes to reassemble. INCLUDES: Two (2) longer side rails, 2 smaller rails for the foot and head of the bed, One (1) mesh cover, Four (4) bolt and hex key; no additional tools required. This extremely budget-friendly dog camping chair offers high quality for a low price. It’s made of thick, solid steel that is easily disassembled for travel, and the fabric is waterproof and easy to clean with a damp cloth (or you can simply grab the hose and hose it down) yet comfortable for your pet. Users describe it as like a hammock and say their pets just love it. This brand of dog camping chairs is also rip and tear resistant. All that’s needed to assemble and disassemble this bed is an allen wrench, which is included. This chair comes in a variety of sizes and can comfortably accommodate dogs up to 90lbs. At just over 5 pounds though, this is not going to be a good choice for a hiking trip but is ideal if you just plan to hang out in a campground for a few days. If you need a good camping chair for your dog, you can’t go wrong with any of our picks. To get the best bang for your buck, choose a chair that’s durable, easy to clean, and water and rip resistant. All of our picks fit the bill, but the best one for you depends on your dog and the type of trip you’re taking. If it involves long hikes in the wilderness, you need something lightweight and compact, if it involves hanging out at a campground for a few days, a heavier and more substantial chair will do just fine. 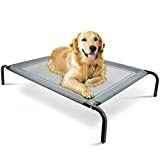 For us, the best pick is the HDP Elevated Napper Cot Space Saver Pet Bed because it can accommodate even geriatric dogs or dogs with joint issues, the cover can be removed for cleaning, and it’s lightweight and easy to tote around. Happy Camping!